Description: Sexes similar. Long tail; falcon-like profile. No ear tufts; facial disks bordered in black. Brown overall with white blotches and dots above, and brown barring on underparts. 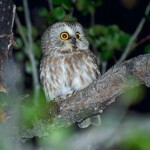 This owl has a dark chin, black eyebrows, yellow eyes, and a pale bill. Flight is low and swift. 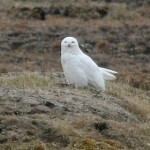 Habitat: Boreal and tundra forests. 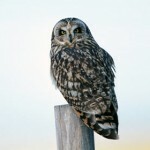 Where in Nebraska: The most diurnal of all North American owls. As they rarely see humans in their far northern habitat, these birds can be exceedingly tame. 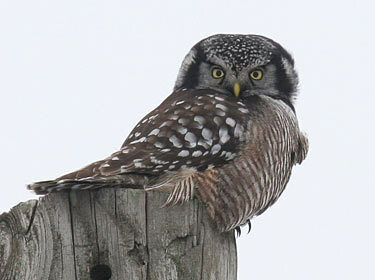 Fun Facts: The Northern Hawk Owl can detect prey up to one foot under snow and up to half a mile away.